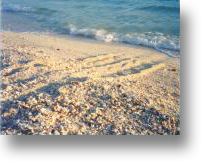 Lahaina, Maui: tracks of 5690 making her sixth nest in 2002. Aloha, and thanks for stopping by. 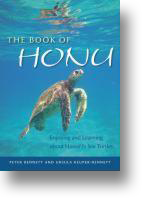 The Book of Honu is now available at all major online bookstores, and on the shelves of stores throughout Hawaii! To Clothahump, the first sea turtle we ever met. Originally a tribute, this excerpt from The Little Prince has become our metaphorical mission statement. 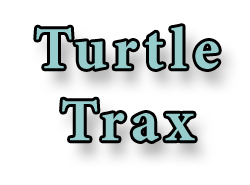 Learn how and why we created Turtle Trax. If this is your first visit, this is a good place to start. Our Contents page has places to go, things to see--everything from tragedy to comedy. We converted to a blog for the summaries of the time we spend on Maui. Last update is 2011/08/23. The Sickbay: A collection of resources about fibropapilloma tumors in sea turtles. You can beat angina and dive again! See our prolog to summer 2002. This is the video version of a Sea Talk presented at Maui Ocean Center on August 14, 2013. 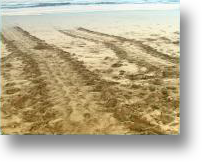 Turtle Trax and turtles.org are hosted by E-Gate Communications, a provider of excellent quality and superb service.